Watch Rafa’s fascinating chat with Carragher & Neville – “I don’t need £200m!” – NUFC blog – Newcastle United blog – NUFC Fixtures, News and Forum. 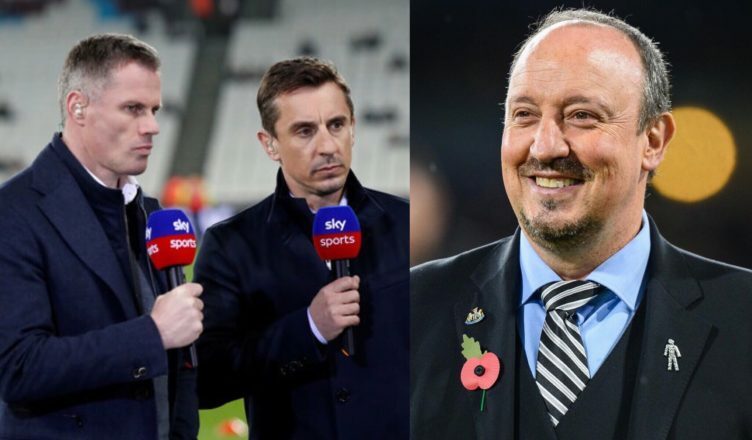 Rafa Benitez has offered a fascinating insight into his demands for the future at Newcastle United during a post match chat with Sky Sports duo Jamie Carragher and Gary Neville last night. The Spaniard was in good spirits and brilliant form as he responded to questions about the game, Almiron, Rondon’s future and his contract demands – and it’s no surprise after such a huge win that all but secures Premier League survival. “You cannot go up against a team thinking ‘maybe we can win’ or that a draw is a good result, no. We need to be stronger. We have the city, we have all the potential. “The city, the club, everyone in Newcastle is supporting the team so it’s massive. “I’m not saying £200m but doing a little bit more, doing the right things, we can compete against the teams that are now maybe between seventh and 12th. But we have to do things right. “Even if you have a lot of money, you can make mistakes in the transfer window but when you have less money, it’s more difficult. “You can do everything right, your tactics, your team selection, your substitutions but if the other team has one player who can make the difference… that is now the Premier League. If you want to sign one of the forward players from Leicester now, you have to pay £30m. “So we have to be more competitive in the window, we have to do things in the right way and then you have massive, massive potential in Newcastle.”“I have been trying to win titles everywhere in different countries. “We have to have a team who can compete. “This city, the club has potential. It’s massive. I’m not looking to spend £200m, but doing the right things. “You can do everything right with your tactics, but the other team has one player that can make the difference. The last line is spot on and speaks volumes. Leicester are in a position we want to be in and they are full of £30m players, highlighting that the ‘big money’ arrival of Almiron must NOT be a one off. Brilliant stuff from an upbeat Rafa Benitez and another reminder of how vital it is that we keep him at the club this summer.